Though little news was made by the Texas Longhorns yesterday regarding player addition, Texas head coach announced there would be several changes in roles on staff. Tight ends coach Derek Warehime received the new title of special teams coordinator. The coach who previously held that role, safeties coach Craig Naivar, relinquished that title in order to focus more on coaching a position the Texas defense has placed a premium on. Herman said Naivar would receive the title of co-defensive coordinator as a result. Football Scoop reported in late January that Naivar was the second highest-paid defensive backs coach in the country behind Charlton Warren, who Georgia recently hired away from Florida to be defensive backs coach. Naivar joins Michigan’s Chris Partridge, Oregon’s Keith Heyward, and Purdue’s Anthony Poindexter as the only safeties coaches on Football Scoop’s list. As safeties coach, Naivar is also responsible for the nickel backers in the Texas defense. In 2017 and 2018, Texas often utilized formations that saw three to five members of Naivar’s position group on the field at the same time. 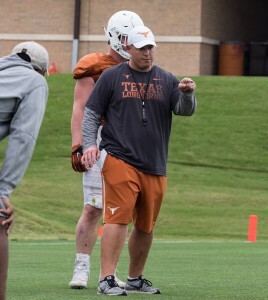 Warehime served as Herman’s offensive line coach at Houston and held that role in his first year at Texas in 2017. When Herb Hand was hired, Warehime switched to tight ends coach, with Corby Meekins switching from tight ends to receivers. All assistant coaches on staff save Hand, defensive coordinator Todd Orlando, and offensive coordinator Tim Beck received two year contracts upon their arrivals in Austin in late 2016 or early 2017. 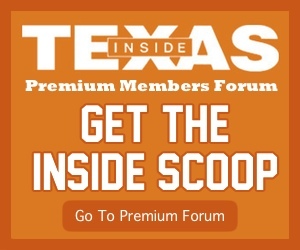 Herman said Wednesday he expects his staff to remain in-tact for the 2019 season.